Crystal Cruises is offering a new, complimentary three-night land program to Thailand and Cambodia with its March Asia-to-Africa World Cruise segment. 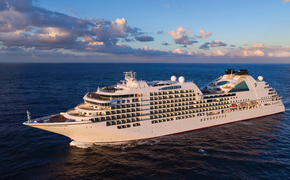 Before sailing from Singapore to Cape Town aboard Crystal Serenity, guests will explore Bangkok and then fly to Siem Reap, Cambodia, to visit Angkor Wat and other sites. Included for guests sailing on the single “Temples & Safaris” itinerary, the land program begins on March 7 and features meals, inter-Asia transportation, one night at the Peninsula Bangkok and two nights at the five-star Sokha Angkor Wat Resort. The cruise begins March 10 with an onboard overnight in Singapore, then sails to Jakarta, Indonesia; Port Louis, Mauritius; and Durban, Port Elizabeth and Cape Town, South Africa. With $700 in savings if booked by Oct. 31, the 21-day land-and-cruise fares begin at $7,520 per person. MSC Meraviglia: Coming to New York & the Caribbean in 2019!